In the previous article (http://ponnadi.blogspot.in/2012/12/charamopaya-nirnayam-ramanujar-our-saviour-1.html) we have seen emperumAnAr's uththArakathvam revealed by many. Now, we will continue on with the next section where more such idhihyams revealing emperumAnAr's uththArakathvam are explained. Once, aruLALa perumAL emperumAnAr's sishyas ananthAzhwAn, echAn, thoNdanUr nambi and marudhUr nambi prostrated in front of udayavar and enquired him "for the jIvAthmA, is there only one AchArya or are there many AchAryas? Please give a clear answer". emperumAnAr instructs them to go and find out the answer from ponnAchiyAr (wife of piLLai urangA villi dhAsar). They went to her and told her "emperumAnAr wanted us to clarify our doubt with you. Is there one AchArya or many AchAryas for a jIvAthmA? Please give us a clear answer". ponnAchiyAr spreads her hair first and collects them all and ties them together and tells them "I should not conclude the answer for your question; How will an incapable person like me will know that? emperumAnAr himself should clarify your doubt". Saying that, she picks up a saffron thread from the floor and keeps that on her head and leaves the place immediately. All of them left the place with an unsatisfied mind and returns to udayavar and offers him praNAmams again. When emperumAnAr enquired them what happened over there, they say that she instructed them to get the answer from emperumAnAr himself. He asked them what was her activity while saying that and they explained the whole incident. emperumAnAr tells them "she did not just leave, she has cleverly explained you the answer for your question and you have not understood her explantion". They request him to explain the meaning for her actions. He explains "the reason why she first spread her hair is to show that it looks like there are many AchAryans for the jIvAthmA from different perspectives. She then collected them and tied them together to show that ultimately there is only one AchAryan who gets him the ultimate goal accomplished. Since she picked up a saffron thread from the floor, she showed that the uththAraka AchAryan is emperumAnAr who is a sannyAsi. By keeping that thread on her head, she showed that emperumAnAr is higher than every one else and should be carried on everyone's head. Since she left the place, she showed that one should keep such AchAryan in their heart very confidentially and constantly meditate on him. So, all of you also have faith in this message". Thus emperumAnAr revealed his AchAryathvam which is the upAyam for everyone through ponnAchiyAr. Once when emperumAnAr was alone, embAr and vaduga nambi approached him, offered their prostrations and asked him "madhurakavi AzhwAr said 'dhEvu maRRaRiyEn' (தேவு மற்றறியேன்) meaning I dont know any other dhEivam other than nammAzhwAr. He fully asserted that nammAzhwAr was his master, refuge and the path and was firmly situated in that mood. We also want to develop such attachment towards charama parvam (AchAryan) instead of prathama parvam (emperumAn) and you please bless us for that". emperumAnAr says "I have already established such strong faith in you as madhurakavi AzhwAr had on nammAzhwAr, what more do you need?". They reply that the same faith should continue for ever. emperumAnAr is very pleased and says that they are situated in the most appropriate mood towards their AchAryan. emperumAnAr says "per 'upAya upEya bhAvENa thamEva charanNam vrajEth' (உபாய உபேய பாவேந தமேவ சரணம் வ்ரஜேத்) meaning one should consider his/her own AchAryan as the upAyam (path) and upEyam (goal), as I can be both upAyam and upEyam both in this world and paramapadham, you can also be dhEvumaRRaRiyEn on me. This does not stop with you, it gets carried forward to everyone who is related to you and your relatives (Athma bandhUs) and that is what will get them the ultimate goal". (Note: The remaining section in this article deals with the relationship between ALavandhAr and nAthamunigaL in a very detailed manner). I worship nAthamunigaL who is the master and refuge for me in both this world (samsAram) and the other world (paramapadham). That nAthamunigaL is the epitome of true knowledge and love for the lotus feet of emperumAn who is the killer of madhU. It is also said in vishNu purANam that "sAdhyabhAvE mahAbAhO sAdhaNai: kim prayOjaNam" (ஸாத்யபாவே மஹாபாஹோ ஸாதநை: கிம் ப்ரயோஜநம்) meaning what is the use of the means (path) if it does not lead to the ultimate goal?, even though once the means leads to the goal and the means is of not use once the goal is accomplished, but since bhattar explains that upAyam and upEyam are fully established in emperumAn (as in the following srI rangarAja sthavam - uththara sathakam slOkam 88) that needs to be accepted. Oh srIranganAthA! Since the upanishdhs declare that srIman nArAyaNan is the one who accepts the service of chith (sentients) and achith (insentients) through srushti (creation), sthithi (sustainance), niyamanam (control), etc. For the chEthanas you being the means and the goal is not just said for formality but it is the full truth; So I accept you as my full refuge. So, once we reach paramapadham upEyathvam (accepting our kainkaryam) will fully manifest, while upAyathvam (being the means) will be concealed (hidden). But since the above slOkam and other pramANams are explained in context of emperumAn (him being upAyam and upEyam) will that be applicable in context of AchAryan? Yes, it will be as we have already seen in "upAya upEya bhAvENa thamEva charanNam vrajEth" (உபாய உபேய பாவேந தமேவ சரணம் வ்ரஜேத்) meaning one should consider his/her own AchAryan as the upAyam (path) and upEyam (goal). And that is why, ALavandhAr declared "athra parathra chApi" (we have already seen this a few paragraphs before). 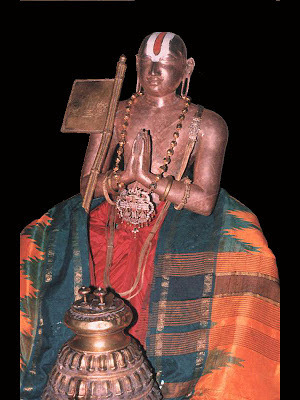 The EvAkAram (Eva shabhdham) in "thamEva" of "upAya upEya bhAvENa thamEva charanNam vrajEth" shows the meaning "only" which means uththAraka AchAryan can also himself will be able to independently accomplish the ultimate goal for his sishyan (since emperumAn has blessed the AchAryan with such ability as in the case of udayavar being the controller of both vibhUthis). Taking shelter of prathama parvam (emperumAn) can sometimes cause fear/doubt in one's mind since emperumAn, out of his svAthanthriyam (independence), can place us either in samsAram or in paramapadham. But taking shelter of charama parvam (AchAryan) will guarantee paramapadham since AchAryan is always parathanthran (subservient/dependent) to emperumAn and filled with mercy towards suffering souls - so he will only look to deliver the sishyan to paramapadham. emperumAn will accept a jIvAthmA only through an AchAryan; But a merciful AchAryan will accept anyone and he himself will establish the bhagavath sambandham to the jIvAthmA. The merciful AchAryan does not expect the sishyan to know about emperumAn first. He himself teaches him everything from the beginning. But emperumAn will look for AchArya sambhandham before blessing the jIvAthmA with the divine knowledge. Thus, when we have the sambhandham with udayavar who builds the confidence in our minds on the ultimate goal and makes it stay forever in our mind, we can certainly be like madhurakavi AzhwAr who said "dhEvu maRRaRiyEn" - I know no one other than nammAzhwAr..
Now, another question arises. If udayavar is said to be the uththAraka AchAryan for AchAryas before and after him, why did ALavandhAr ascertain upAyathvam in nAthamunigaL (sthOthra rathnam slOkams "athra parathra chApi" and "akruthrima ... pithAmaham nAthamunim vilOkaya"). Let us see how. nAthamunigaL passed on all the secret meanings, the divine dream in which he saw bhavaishyadhAchAryan and the bhavishyadhAchAryan vigraham to uyyakkoNdAr and foreseeing the appearance of ALavandhAr, he instructs uyyakkoNdAr to pass on all of the same to ALavandhAr. Since uyyakkoNdAr did not have the opportunity to witness ALavandhAr's birth and early life, he passes on the same to maNakkAl nambi and instructs him to do the same. maNakkAl nambi reforms ALavandhAr and explains him all the details and passes on the bhavishyadhAchAryan vigraham to ALavandhAr. ALavandhAr develops great gratitude towards his grand father nAthamunigaL who first blessed him even before his appearance, who revealed the great meanings of the sampradhAyam, gave the bhavishyadhAchAryan vigraham, blessed him so that me sees rAmAnujar in his life time at kAnchipuram and finally appears through the dream of maNakkAl nambi and reveals the same through nambi to him. Thus being overwhelmed by the gratitude, he thinks that he should have very strong attachment towards nAthamunigaL forever and to reveal that to others that he is attached to nAthamunigaL who revealed him all these great details, he declares in his sthOthra rathnam that nAthamunigaL is the upAyam and upEyam for him. But in his heart, ALavandhAr also has the same emotions/attachment towards udayavar as had by nAthamunigaL. Also, he declared his attachment towards udayavar in sthOthra rathnam slOkam 5. I worship the lotus feet (which is filled with kainkarya sri) of nammAzhwAr who is the leader of all vaishnavas, who is decorated with the beautiful maghizham flower garland and who is the father, mother, lovable person (husband/wife), children, wealth and everything else for me and all my descendants. Since, ALavandhAr shows that AzhwAr's lotus feet are everything for him and those lotus feet are nothing but udayavar himself, it is ultimately established by ALavandhAr that udayavar is the uththAraka AchAryar for everyone. Since in the sthOthra rathnam slOkam 2 (thasmai NamO), he said "madhIyam charaNam" (மதீயம் சரணம்), he is talking in first person (for himself only), he shows gratitude to nAthamunigaL for the favours done by him. But here in this slOkam 5 (mAthA pithA) since he says "for me and my descendants", udayavar's uththArakathvam for everyone is fully established. In the next section, we will see some more idhihyams on udayavar's uththArakathvam.